Rose Lacey (Fiona Glascott) wants her sister, Ellis (Saoirse Ronan) to have the best life possible. Unbeknownst to Ellis, Rose had made arrangements, with Father Matt Glynn (Jim Broadbent) in Brooklyn, NY, for Ellis to move from Ireland to Brooklyn. There she will have a job waiting for her, be able to go to school, and live in an Irish boarding house. Ellis finds the move difficult, but, in time she learns the retail business, excels in bookkeeping school, meets a guy, Tony (Emory Cohen), and falls in love. But tragedy strikes and Ellis decides to go back to Ireland “for a month” to be with her mother. Before she goes back, Tony, very smartly, suggests that they get married….which they do. Back in Ireland, the newly married Ellis becomes confused. She is offered a bookkeeping job, meets another nice guy, and has thoughts of staying. Ireland is, after all, home. Does Ellis stay in Ireland or go back to her husband in Brooklyn? To find out, rent the movie, it is well worth the cost and time. 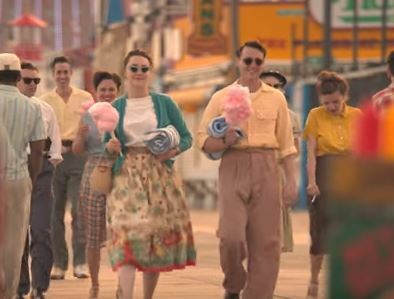 “Brooklyn” is a beautiful movie good for the whole family, but, will appeal to adults more than the young kids or teens. Well acted with a superb cast. Saoirse Ronan and Emory Cohen are perfect together.